The lens of the eye is normally transparent. As we age this lens becomes cloudy. When a cloudy area develops in the lens, it is called a cataract. The amount of light that passes through the lens is reduced and scattered by the cataract reducing the clarity of the image. The result is that vision becomes increasingly cloudy. There are many misconceptions about cataracts. A cataract is not a film visible on the outside of the eye, and using the eyes does not make it worse. Cataracts can occur as early as 40 years of age, but mainly in people over the age of 55 years. It is the leading cause of vision loss in older adults and may affect up to 60% of adults over the age of 65 years. 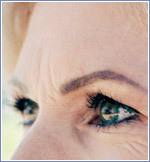 Age related cataracts – This is the most common type of cataract. Congenital cataracts – Some babies are born with cataracts or develop them in childhood. Secondary cataract – Cataracts are more likely to develop in people who have certain other health problems such as diabetes, or secondary to the use of some medications. Traumatic cataract – A cataract from an eye injury may occur years later. Surgery is often the only effective treatment for cataracts. Cataract surgery is the most common eye operation performed and is usually carried out under local anaesthetic with light sedation administered by a specialist anaesthetist. 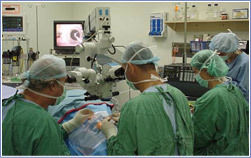 It is a delicate operation that involves manipulation of the tiny structures inside the eye. A high powered microscope is used to view the parts of the eye clearly. A tiny incision is made at the outer edge of the cornea and a probe is inserted which is used to remove the cataract. This probe uses ultrasound which breaks the cataract into tiny pieces allowing the cataract to be gently vacuumed from the eye. An artificial lens is then inserted, called an intraocular lens. This lens is needed to bring light rays into proper focus onto the retina. The incision created is self-sealing and usually no sutures are used, which increases post-operative comfort, improves recovery and the final visual result. After surgery your eye will be padded until your post-operative visit to Dr Martin’s rooms the day following your procedure. The pad will be removed and your eye and vision will be assessed. You are to begin your eye drops as per instructed by Dr Martin up until your next visit, usually 1-2 weeks. Your vision should improve following surgery, but this depends on several factors. 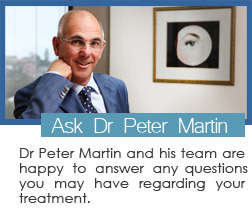 Please ask Dr Martin of your expected visual outcome. Some patients may still require glasses even after the surgery, which are usually prescribed 4 weeks post-operatively. Cataract surgery results are usually excellent, however complications can occur. 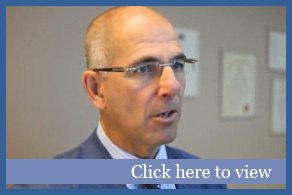 Dr Martin routinely discusses any risks with his patients at their pre-operative consultation. Quite often, several months or even years following cataract surgery, the posterior capsule of the lens (which is not removed during cataract surgery and that originally held the natural lens, but now holds the intraocular lens implant) can itself become cloudy. A Nd-YAG laser is used to make a hole in this capsule, thus allowing light to pass freely again to the retina.